Reminisce about a simpler time as four 20th century mountain pioneer women share their cooking secrets. 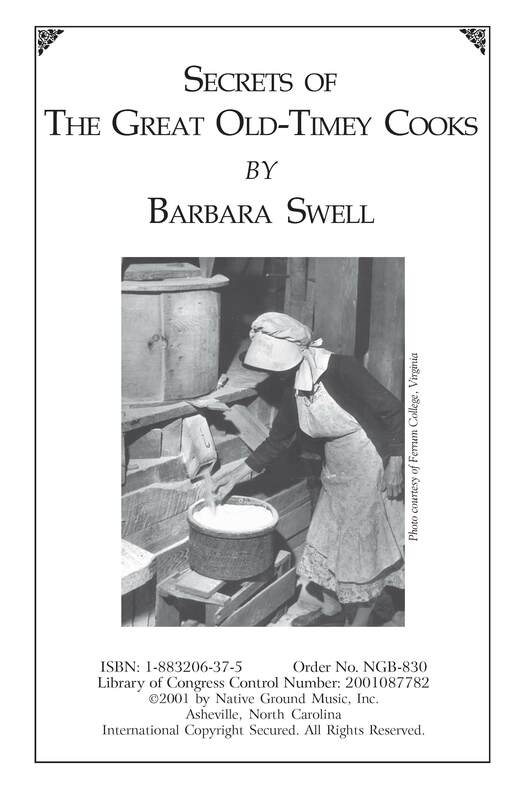 These great old-time cooks stir in their own wisdom and tales of growing up on rural farms, where they prepared delicious meals by lantern light on wood cookstoves. Included are heirloom recipes, proverbs, folk remedies, 80 vintage photos, 19th century autograph rhymes and lots of stories. 5 ½ x 8 ½, 72 pages. RECIPES INCLUDE: Beverages: Blackberry Cordial, Grape Juice Lemonade, Dandelion Wine, Mulled Cider, Russian Tea, Sadie’s Punch, Soups: Celery Soup, Dried Com Chowder, Fresh Pea Soup, Tomato Bisque: Breads: Biscuits, Fannie’s Graham Bread, Graham Puffs, Gritted Cornbread, Huckleberry Scones, Jam Windmills, Raisin Graham Bread, So. Mt. Cornbread, Sweet Potato Buns, Sweet Potato Dumplings, Meats: Apple Maple Duck, Blackbird Pie, Chicken & Dumplings, Curried Chicken & Rice, Hot Pot, Oyster Loaves, Pork Snow Birds, Roast Beef Pie, Vegetables: Apple Stuffed Pumpkin, Baked Corn in Peppers, Carrot Puffs, Eggs & Baked Tomatoes, Fried Corn, Green Beans, Onions Stuffed, Potato Rissoles, Scalloped Tomatoes, Shuck Beans, Winter Saccatash, Apples & Berries: Applesauce Dumplings, Apple Dumpling Pie, Cider Fruit Cake, Jewel Berry Fool, Mom’s Apple Cobbler, Strawberry Dumplings, Desserts: Apple Stack Cake, Chocolate Popcorn, Coconut Stack Cake, Ginger Nuts, Gingerbread, Jam Pie, Salty Peanut Cookies, Spiced Jini Cakes, Pickles and Butters: Apple Butter, Pickled Beans, Refrigerator Pickles, Mock: Cherry Pie, Coconut Macaroons, Honey, Macaroni, Turtle Soup. The first page of this book brought back so many menories, it almost made me cry. I love it. Your book stirs up memories of my grandmother’s kitchen and all the goodness of home. I really, really liked Secrets of the Great Old-Time Cooks. I bought Secrets of the Great Old-Timey Cooks and Mama’s in the Kitchen and just loved reading them and trying the recipes. Very interesting and different from the other books I buy and read! An ideal and inexpensive gift for kitchen cookbook collectors. Secrets of the Great Old-Timey Cooks is a wonderful compendium of historic American recipes, folklore and country wisdom. Profusely illustrated. 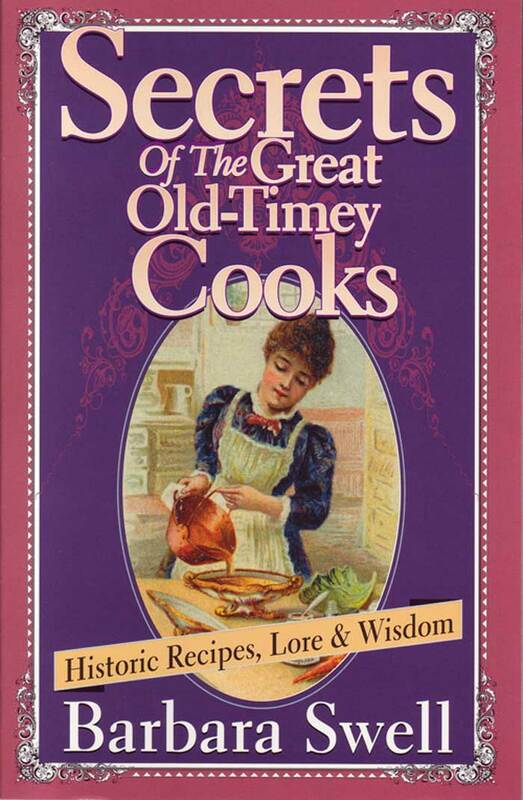 If you like to cook and have a fondness for ‘the good old days,’ then secure a copy of Secrets of the Great Old-Timey Cooks.